Emily Giffin posted an image on Facebook with her and star John Krasinksi, confirming that 'Something Borrowed 2' would be moving forward. Way back in 2011, fans of novelist Emily Giffin were pleasantly surprised with the release of her hit novel Something Borrowed being brought to the big screen. While the movie received mixed reviews, most critics could agree on the fact that the best parts of the movie were scenes with #JohnKrasinski and #KateHudson. Luckily, there was a built-in sequel in the follow up novel, Something Blue, which sparked Hollywood's interest enough to green-light #SomethingBorrowed2. "I’ll also be working on bringing 'Something Blue' to the big screen. We have a fantastic script—and I promise it’s happening soon! Very soon!" Krasinski and Hudson in'Something Borrowed' / Warner Bros.
Kate Hudson (Darcy) and John Krasinski (Ethan) had an amazing chemistry together, so it is lucky that the sequel will follow the two through the beginnings of their relationship, which has become strained over the years. Ethan was always closer to Rachel, who was initially Darcy's best friend until Dex, Darcy's fiancé, cheated and left her for Rachel. Darcy and Ethan spend time together out of necessity to begin with but, like all good romances, things do begin to blossom between the two. Never fear, those that were rooting for these two, however. Emily Giffin confirmed last Valentine's Day on a Facebook post (see above) that they are still together and going strong. They also make a few brief appearances in the novel. While Ginnifer Goodwin (Rachel) has gained popularity thanks to her work with Once Upon a Time and Zootopia, it would be nice to have her come in for a cameo role, just to see what these two have been up to. Hudson and Goodwin in 'Something Borrowed' / Warner Bros. When we last saw Darcy, she was chasing Ethan down with a very pregnant stomach. With there being so many years between the movies, it will be interesting to see if they decide to just pretend no time has passed, or skip ahead and come up with a semi-new concept with the children already born. 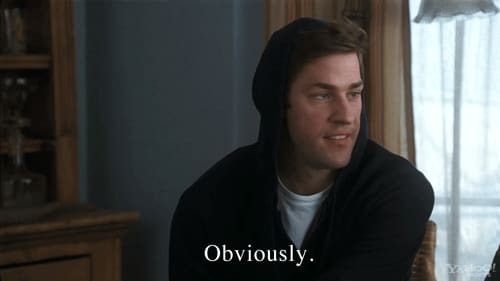 Ethan and Darcy in'Something Borrowed' / Warner Bros.
And with Krasinski and Hudson once again starring, could you expect anything less? This movie could very well become one of the few in Hollywood that surpasses its predecessor and exceeds all expectations. With the author having a hand in the script and an amazing cast, this has all the makings of a perfect romantic comedy. Here's hoping that we don't have to wait too long to see it! Michael Chernus Joins the Cast of 'Spider-Man: Homecoming' as the Terrible Tinkerer! Confirmed: Joe Manganiello Is the DCEU's Deathstroke! Will 'Watchmen' Return on HBO? Good News: 'Game Of Thrones' Is NOT Threatened By Brexit!